Dictionary is not only for the people who don't understand the meaning of a word but also used to know the spelling of a word because there are certain words which may phonetical sound the same but spell differently. Using short forms/abbreviated terms during chats is common among teens of this generation for an easy and fast way to communicate and convey information to anyone in contacts. Though most of the short forms are auto added in Messenger dictionary by default but short forms are extended day by day which interfere while typing to project a sentence but eventually auto-corrected to something else by the android keyboard bots. How to Turn ON/Off Predictive Text While Typing in Messenger? Did you know! Text auto-correction is not a distinctive feature of Whatsapp, the WhatsApp or in any other social messenger's typewriter will be incorporated with either the Android default keyboard or the custom keyboard. 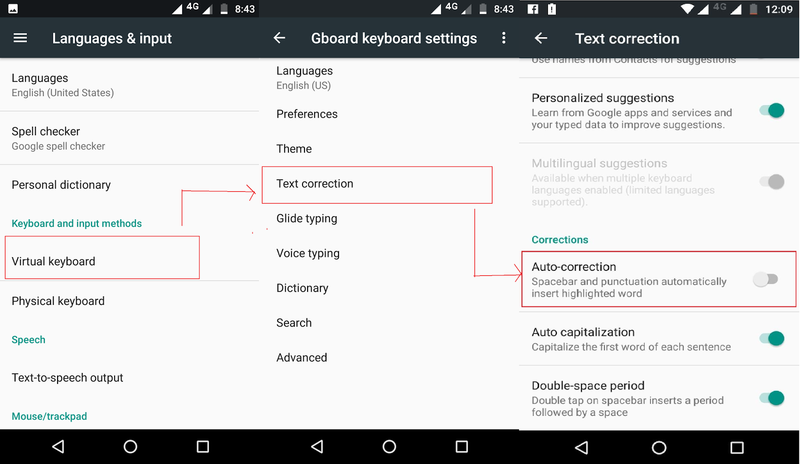 Hence to disable the feature one has to make changes in android/custom keyboard settings. Here in this tutorial, we've used Moto G5 Plus variant with Android nougat and Asus Zenfone to show the relative difference to make the changes in handsets of different brands and different keyboards. (i.e. Moto G5 Plus we are using default Google keyboard and Asus keyboard for Zenfone). The steps described below may slightly vary in other brands but no much difference in the navigation. 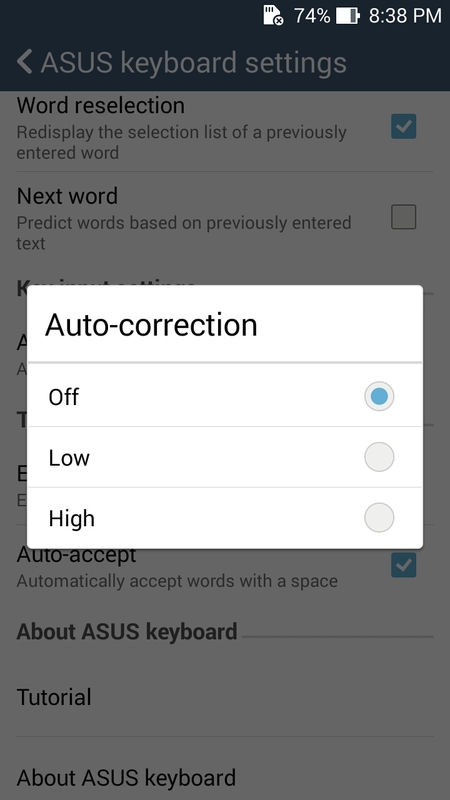 Important Sequence steps to disable/enable text correction. 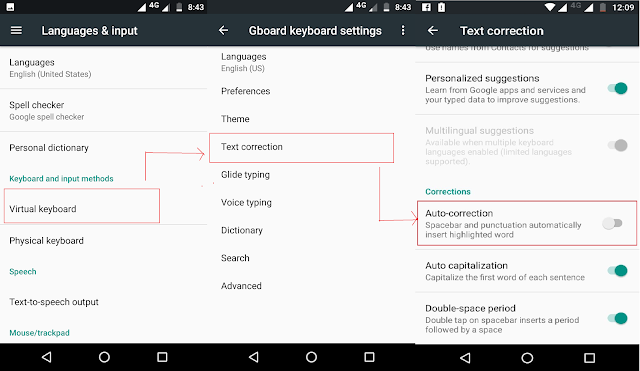 STEP 2: Under Gboard default Google keyboard tap on Text Correction to Enable/Disable text auto correction. Step 3: And you're done, now no suggestions will be listed underneath the typing area of the keyboard and no other words will overlap the text you type. Unlike moto g5 plus which is a pure stock Android device, the Asus Zenfone devices come with customized user interface for easier user access to everything. With a slight difference from moto g5 steps to disable text auto correction, follow the steps below to change the settings. Step 2: In Keyboard & Input Methods - > Asus Keyboard - > Under Asus Keyboard Settings - > Key input settings - > Auto correction. Off - To turn off auto correction completely, which never suggest anything just a raw text. 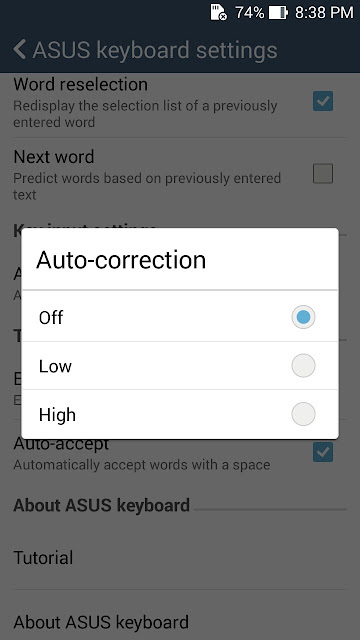 Low - To turn on the auto correction moderately. High - This mode is so sensitive, which auto-corrects everything which is not in the default dictionary and also suggest/pesters several keywords based on text typed. Step 4: And you're done with the settings, the changes will reflect immediately from now on. 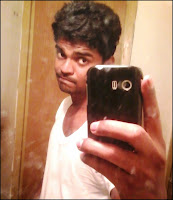 Also Read: How to recover deleted whatsapp text message.